SAI Angan, a division of SAI International School is ranked as the No.1 preschool in Bhubaneswar for the 3rd consecutive year, by the EducationWorld India Preschool Rankings 2018-19. 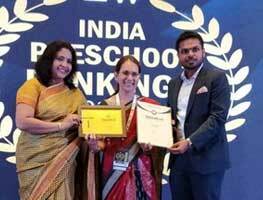 The award was received by Vice Principal Ms. Rashmi Pandey at the 9th Early Childhood Education National Conference 2019, at Bangalore on Saturday, January 19, 2019. Delhi based Market Research Agency, Centre for Forecasting & Research Pvt. Ltd (C fore) undertook the assessment to rate and rank the high performing preschools from across the country. A national sample of 8,245 respondents comprising parents with preschool children, principals and teachers were interviewed by over 100 field staff of C fore in 16 cities. Preschools in each City was ranked on a ten-point scale across ten parameters like Competence of teachers, Teacher welfare, Individual attention to students, Value for money, Leadership/management quality, Parental involvement, Innovative teaching, Safety and hygiene and Special needs education. SAI Angan, India’s largest playschool is based on the philosophy of providing positive early learning experiences, through a specially crafted multi-sensory approach. The classrooms are fragmented into different areas, each assigned to a specific skill, to increase the effectiveness of multi-sensory approach of learning. The technology aided comprehensive well-researched curriculum provides children an excellent opportunity to hone their intellectual, educational and emotional skills. Each child is provided individual attention, which ensures a strong foundation for wholesome learning between 2 to 7 years of age. In a highly secure, balanced and nurturing environment, students are prepared for formal schooling.